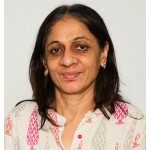 Experience : In private practice for 27 years, having NICU, PICU since 14 years, having development centre since 13 years. Speciality Interest : Developmental Paediatric, Genetics. Work Experience : Held post as President & Secretary IAP Baroda, Secretary NNF Gujarat state branch, convenor at developmental meets. Associations and Memberships : Life membership of IAP (National), IAP (Gujarat), NNF (National), NNF (Gujarat), AOP (Baroda), voluntary work at Arpan (NGO), Dhanvantari school for special children (NGO – Bhuj).